Methods of spinal arthrodesis continue to evolve in efforts to treat back pain. The latest techniques include approaching from the anterior, posterior, lateral, and posterolateral. The transforaminal interbody lumbar fusion (TLIF) developed by Harms  is a modification of the posterior lumbar interbody fusion (PLIF). The procedure varies primarily in the access to the spine, being a unilateral, posterolateral approach to the spine . Simultaneous pedicle screw fixation can be used to achieve anterior column stability. Portions of this chapter are reprinted with permission from Ozgur BM, Yoo K, Rodriguez G, et al. 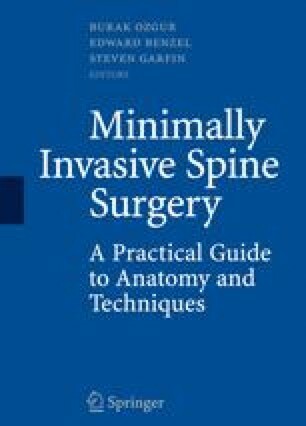 Minimally-invasive technique for transforaminal lumbar interbody fusion (TLIF). Eur Spine J. 2005 November;14(9):887–894. Epub 2005 September 8. Reprinted with kind permission of Springer Science + Business Media.